Authentic Eero Aarnio Pastilli chair designed by Eero Aarnio in 1967. This chair is also known as the Gyro or Pastil chair. The Pastilli Chair received the American Industrial Design-Award in 1968 and can be found in numerous museum collections. 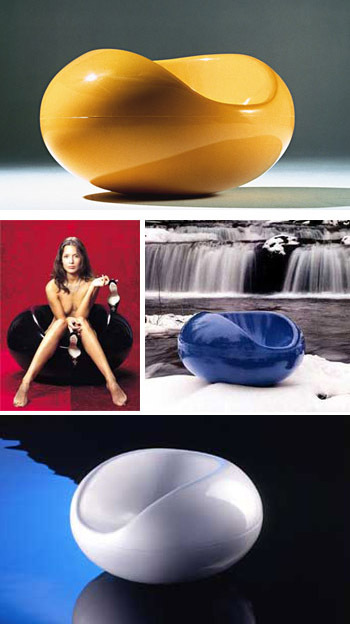 The New York Times wrote about the Ball Chair and Pastil Chair at this time: "the most comfortable forms to hold up the human body", and the Conran's Design Dictionary says "they look like essays in period style, perhaps from Barbarella". The Pastilli can be used both indoors and outdoors, and it even floats on water! The Pastilli chair gives a new, extraordinary idea of what a rocking chair is. It is amazing how comfortable one can sit a in such a shiny, oversized "sweetie" slightly turning and rocking side-, back- and forwards. Eero Aarnio about the Pastili Chair: "The Pastil shape can be looked at from many angles. The initial idea could be the same as in a Screw Table i.e. the product shape comes from a small sweetie, pastil, but in this case the idea was, that a lot of empty, cushioned space is sent to the other side of the world inside the Ball Chair. A new round chair would fit in this space, and so the diameter of the Pastil is the same as the opening of the Ball Chair. I made the first prototype out of polystyrene which helped me to verify the measurements, ergonomics and rocking ability.